UPDATED — WASHINGTON (CNS) — Pope Francis has accepted the resignation of Bishop Paul S. Loverde of Arlington, Virginia, and named as his successor Bishop Michael F. Burbidge of Raleigh, North Carolina. The pope also accepted the resignation of Archbishop Roger L. Schwietz of Anchorage, Alaska, and appointed Bishop Paul D. Etienne of Cheyenne, Wyoming, to be his successor. The changes were announced Oct. 4 in Washington by Msgr. Walter Erbi, the charge d’affaires at the apostolic nunciature to the United States. 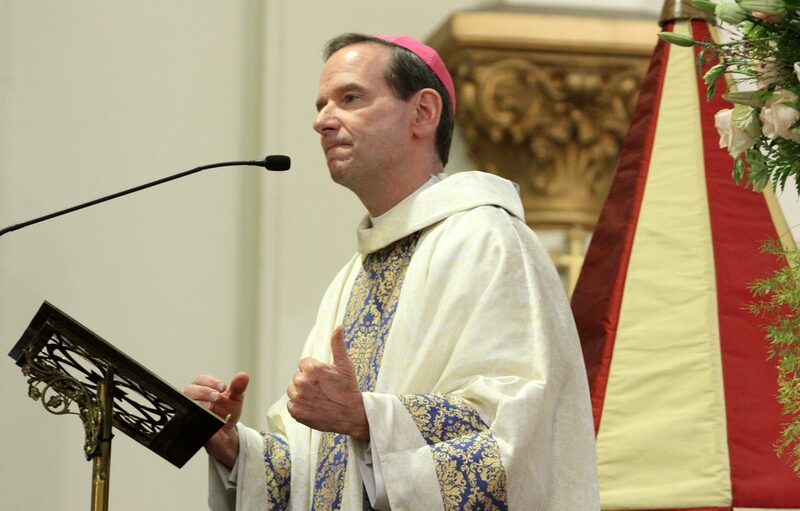 Bishop Burbidge, 59, was ordained a priest for the Archdiocese of Philadelphia in 1984 and was ordained an auxiliary bishop of Philadelphia in 2002, serving in that role until 2006 when he was installed as bishop of Raleigh. He will be installed as Arlington’s fourth bishop Dec. 6 at the Cathedral of St. Thomas More in Arlington. Both Archbishop Schwietz and Bishop Loverde are 76. Canon law requires bishops to submit their resignation to the pope at age 75. 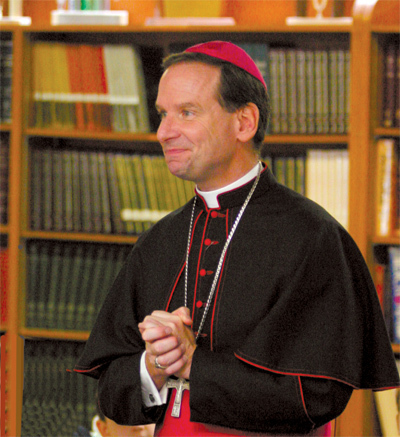 Archbishop Schwietz has headed the Archdiocese of Anchorage since 2001. Bishop Loverde has headed the Arlington Diocese since 1999. Born June 16, 1957, in Philadelphia, Michael Burbidge studied at St. Charles Borromeo Seminary. He holds master’s degrees in theology, administration and education, and has a doctorate in education. After his priestly ordination he served as dean of formation and eventually rector of St. Charles Borromeo Seminary (1999-2004), and administrative assistant to the archbishop. He also served on the board of seminary admissions, the priests’ personnel board and on the priests’ council. Bishop Loverde, who was born in Framingham, Massachusetts, was ordained a priest for the Diocese of Norwich, Connecticut, in 1965. He was named an auxiliary bishop of the Archdiocese of Hartford, Connecticut, in 1988, and was ordained a bishop in April of that year. In November 1993, he was appointed bishop of the Diocese of Ogdensburg, New York, and was installed in January 1994. He served there until his appointment as bishop of Arlington. The Diocese of Arlington covers 6,500 square miles in Northern Virginia. Out of a total a population of 3.2 million people, about 458,000 or 14 percent, are Catholic. Archbishop Etienne, 57, has headed the statewide Diocese of Cheyenne since December 2009. On a national level, Archbishop Etienne is currently chairman of the U.S. bishops’ Subcommittee on Catholic Home Missions and has been president of Catholic Rural Life since 2013. He also is serving his second term as a member of the U.S. bishops’ Committee on the Protection of Children and Young People. Born June 15, 1959, in Tell City, Indiana, Paul Etienne attended the Pontifical North American College in Rome and he holds bachelor and licentiate of theology degrees from the Pontifical Gregorian University, also in Rome. He was ordained a priest for the Archdiocese of Indianapolis in 1992. After ordination, he served in several Indianapolis parishes, and was director of vocations for the archdiocese. Archbishop Schwietz, a native of St. Paul, Minnesota, was ordained an Oblate of Mary Immaculate priest in 1967. He was appointed bishop of Duluth, Minnesota, in 1989, and ordained a bishop Feb. 2, 1990. In 2000, he was appointed coadjutor archbishop of Anchorage, a year before succeeding Archbishop Francis T. Hurley. The Archdiocese of Anchorage covers about 139,000 square miles. Out of a population of about 483,000, a little over 27,000, or 6 percent, are Catholic.